But hang on, wasn’t there someone missing? 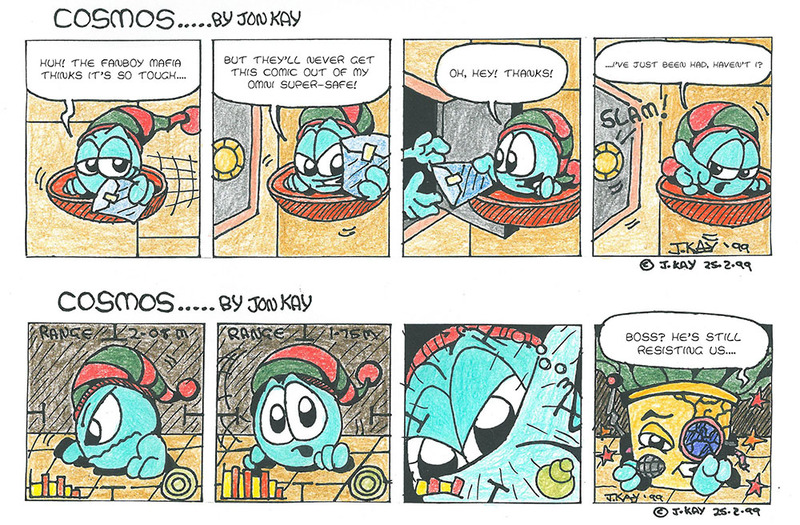 but look at the second strip! It’s an entirely new type of Cosmosian! Then, of course, the Type One’s and Type Two’s started appearing together on-panel. Now there’s another landmark event for you! Although the Type Two’s merely served as a bit of variety in Type One crowd scenes, I had now clearly established both of these green alien forms as ‘Cosmosians’; distinct from any of the other random creatures that had shown up thus far. 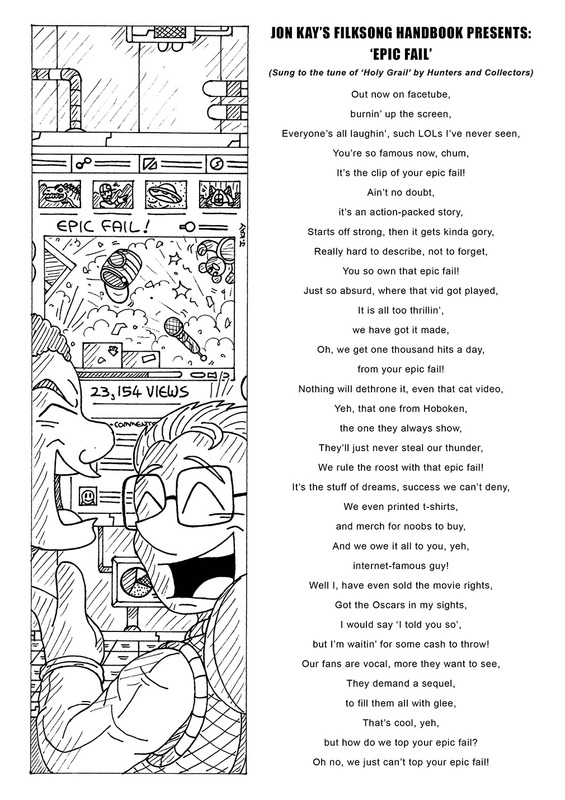 And that was something I could build on.... Not only that, I’d laid the foundations for two other elements in the strip—the fact that the characters attended comic conventions, with all their attendant in-jokes and pop-cultural asides; and a place called ‘Pago Grande’, wherever that was. No, I have no idea where the name came from (I do know it translates as ‘Big Money’, so at least it’s coherent), and I strongly suspect that I just stuck two words together because they sounded good; but that doesn’t matter. 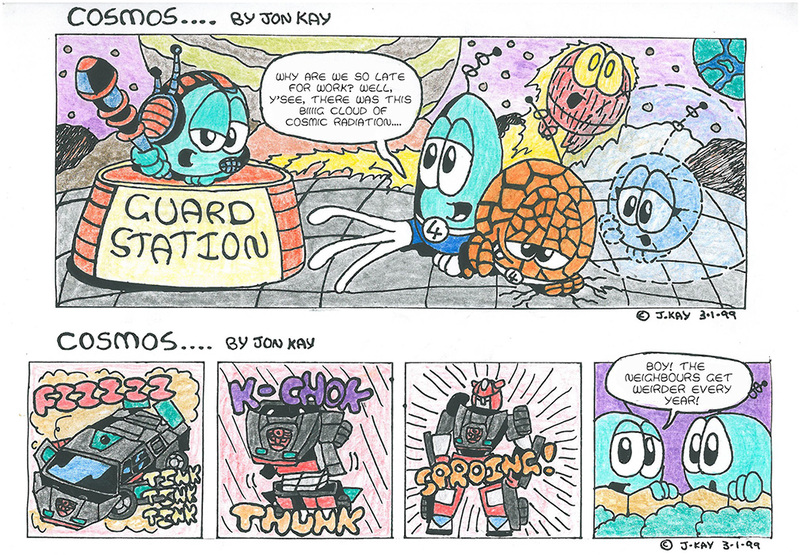 The Cosmos-verse was starting to come together! The 3rd of January, 1999. 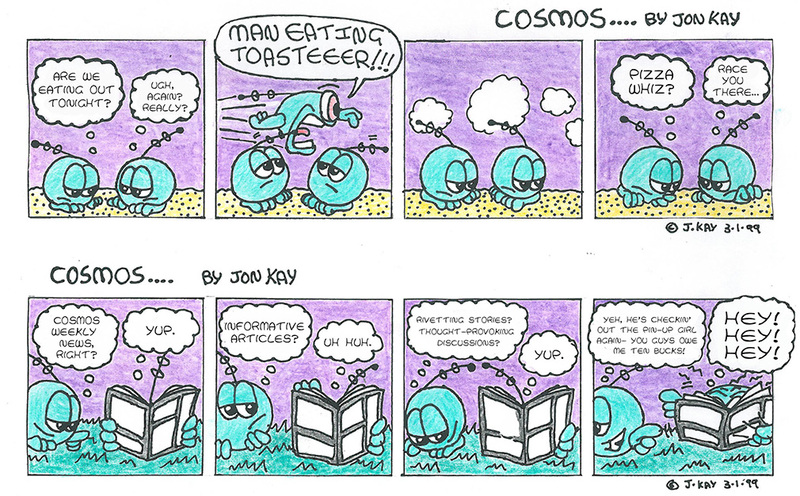 Mark that date in your calendars, people, because—for me, at least—it’s a significant day in the annals of history: the day I drew my very first Cosmos strip. I like to call this stage in the development of any project the ‘flailing around in the dark’ phase—without any clear direction to go in, I try anything and everything, in as many different directions as possible; until things start to link up and form into coherent patterns. What results is a whole wealth of ideas (some good, some awful) that give me any number of options to pursue; which in turn may spark off other things later on. 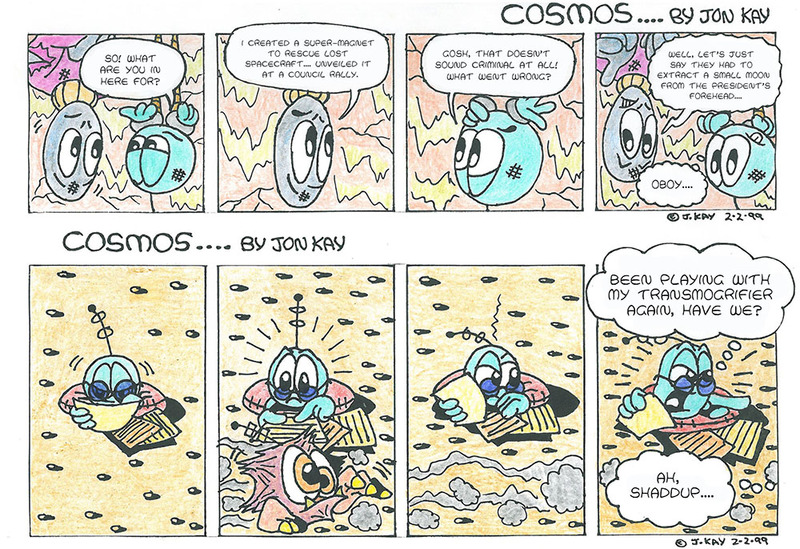 And that’s certainly the case with Cosmos: all of these early strips, at least, are unique; and despite no real guiding principle behind them (aside from pop-cultural silliness, of course) I’m clearly having fun coming up with random little jokes. And that’s the important thing, right? Call him the original Cosmosian. Professor Phineas Percival Pod did indeed come first. 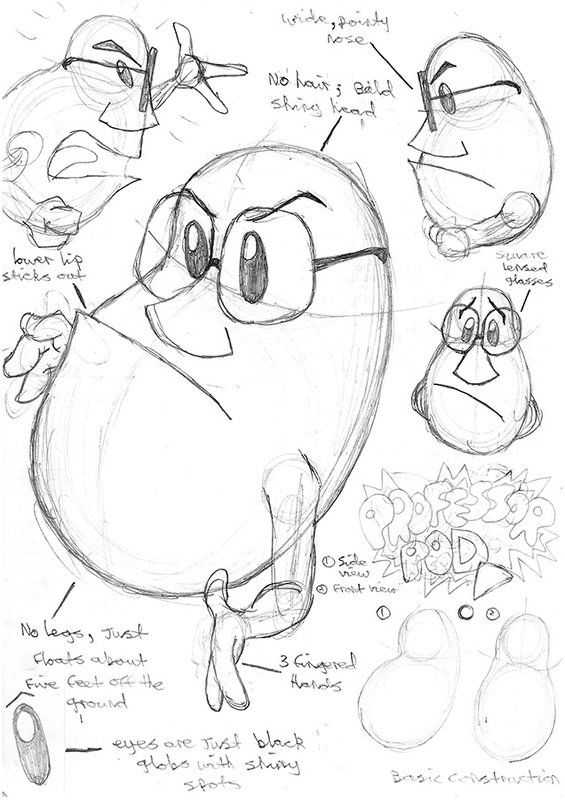 One idle 1998 lunchtime during my one and only year at animation school (otherwise known as ‘too-far-too-soon-after-high-school’), I was fiddling around with a bunch of random doodles when I hit upon a character I felt had a certain spark: a roly-poly, floating bean-shaped creature with a stern expression and giant nerd-glasses. Based on my original sketch of him—or rather, a hastily rubbed out and re-written name tag on said sketch—his name was originally going to be ‘Prof. Head’ (make of that what you will)! But clearly, that name offended my sense of iambic pentameter (or something), so I changed it to Professor Pod.... and a star was born. And then I completely forgot about him. 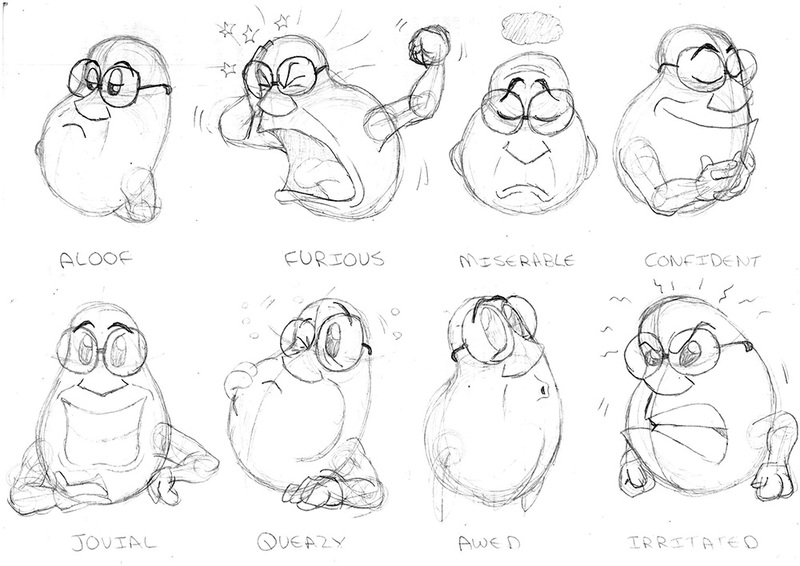 Fast-forward a couple of years, and the grand melting pot of ideas that is Cosmos was in full swing—I’d already incorporated several other old creature and prop doodles into the strip by that time (resulting in Murph and Newton, among other things), and one day I came across my Professor pod stuff. 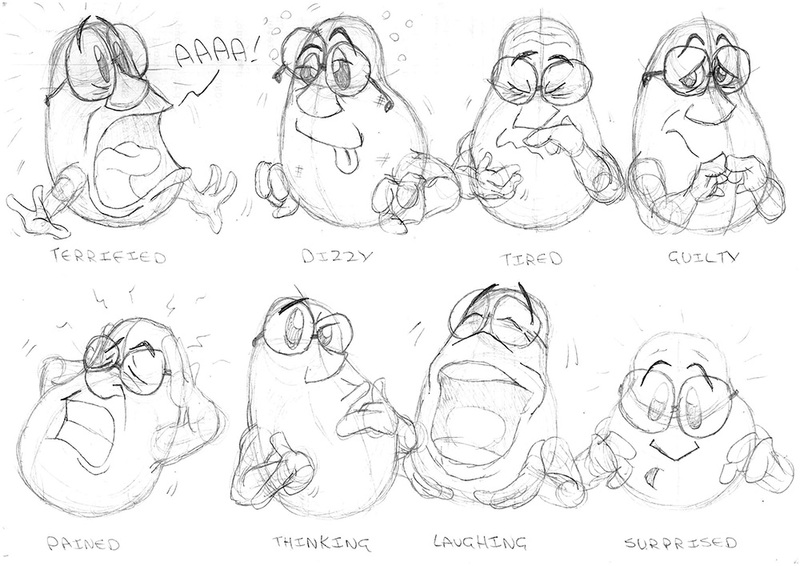 I thought “Oh, yeh.... this guy!” and made plans to incorporate him into the strip. Conveniently, I’d once coloured the Good Professor in the exact same shade of aqua-green as the Cosmosians ended up being, and he therefore was a shoo-in for inclusion. 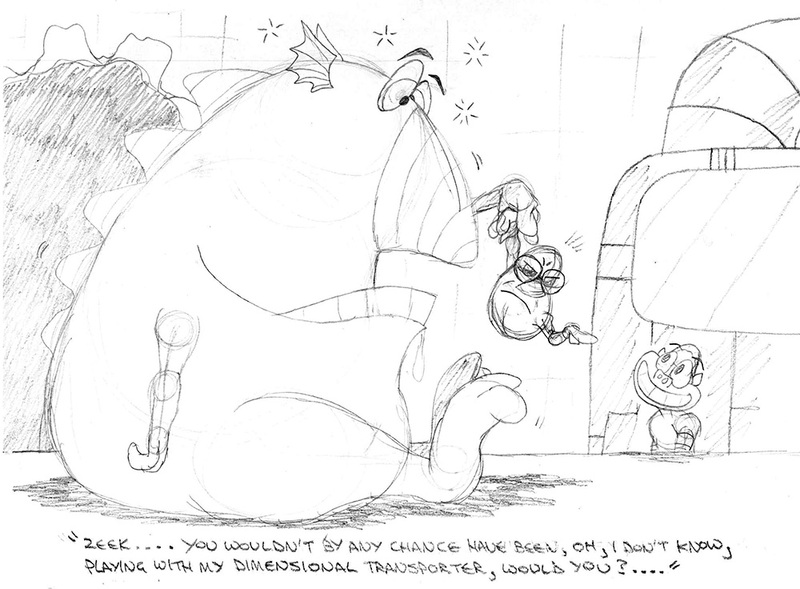 Without much more than a few cosmetic changes, he was instated as the strip’s resident super-genius, showing up whenever Artie and Gene needed to annoy someone with more expensive and dangerous stuff. Was it fate? Had Professor Pod been pre-destined to occupy his future role? 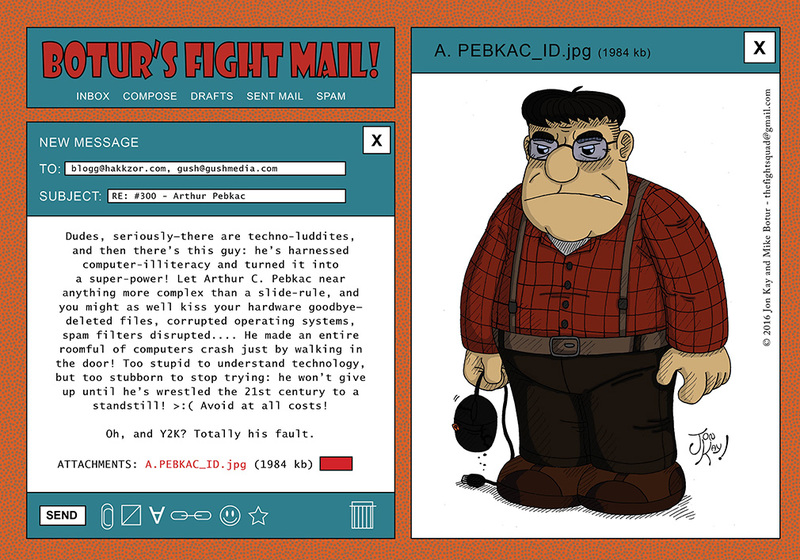 If you've ever thought "Hey, PEBKAC (Problem Exists Between Keyboard And Chair) sounds like a cool name for a cartoon character".... You're too late! The Fight Squad Project has beaten you to it! Bet you wish you hadn't spent all day sleeping in NOW, huh? 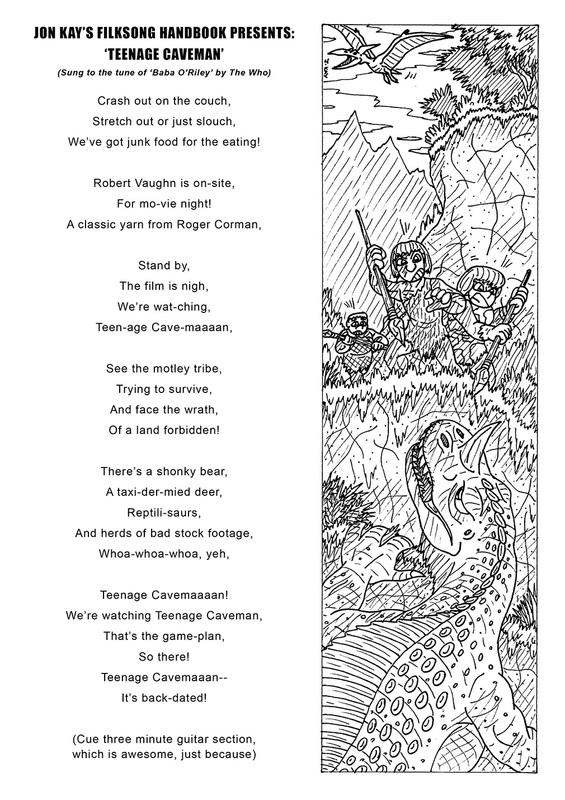 Well, if there's one thing I enjoy, at least as much as drawing, it's writin' me up a filksong! 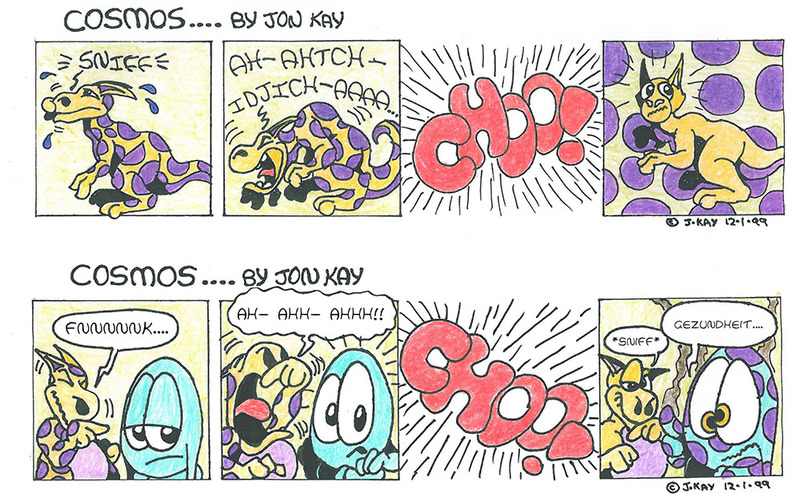 I'm not sure how I got into it - I suspect that the mad stylings of Mad Magazine parody songs and Weird Al Yankovic are to blame - and I certainly don't have any formal training writing songs or singing; but I seem to be developing the art quite nicely. I've done at least a dozen filk-things thus far, and there's quite a few others (in embryonic form) floating around in my subconscious: here's the latest two in the set, for your maximum enjoyment! Score one for Mr. Vince! Vince Di Cola! 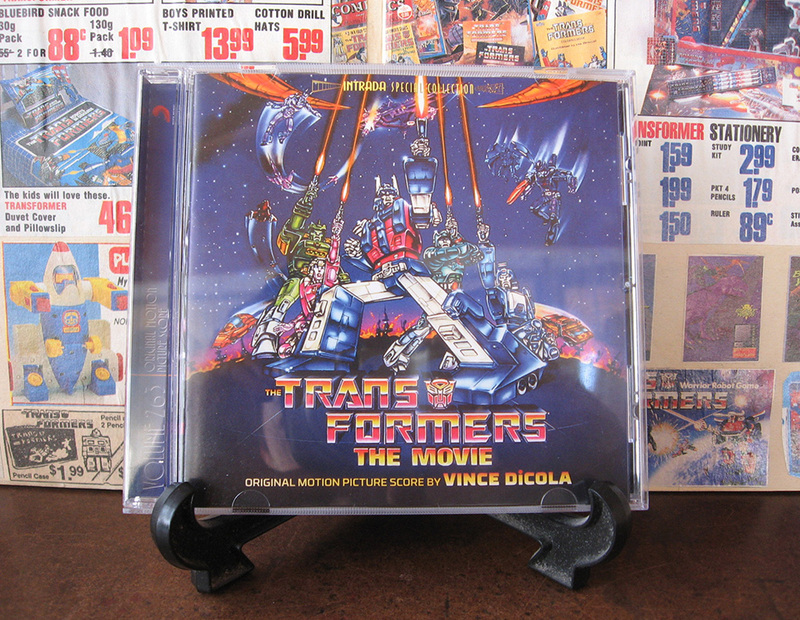 Part of what made Transformers: The movie so unbearably awesome was Mr. Di Cola’s 80’s-tastic synth-rock anthems; which covered everything from epic battles to somber death scenes (spoiler alert: Prime doesn’t make it). 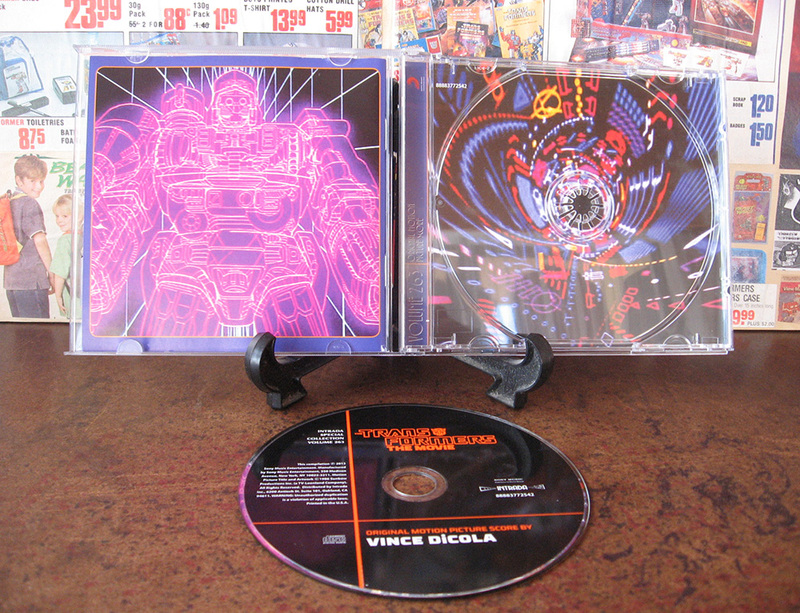 But aside from legally-iffy recordings on Youtube and limited-editions-of-whoops-we’ve-sold-outalready compilations released at transformers conventions, how was I supposed to get my hands on some pure, unadulterated Vince-ness? Well, thank you, intrada.com, I finally have my answer. Who the flip-flopping flippity-flop is Kevin?! Ah, you can but laugh. shifted to a different scene, or swapped out for one of the soundtrack songs. 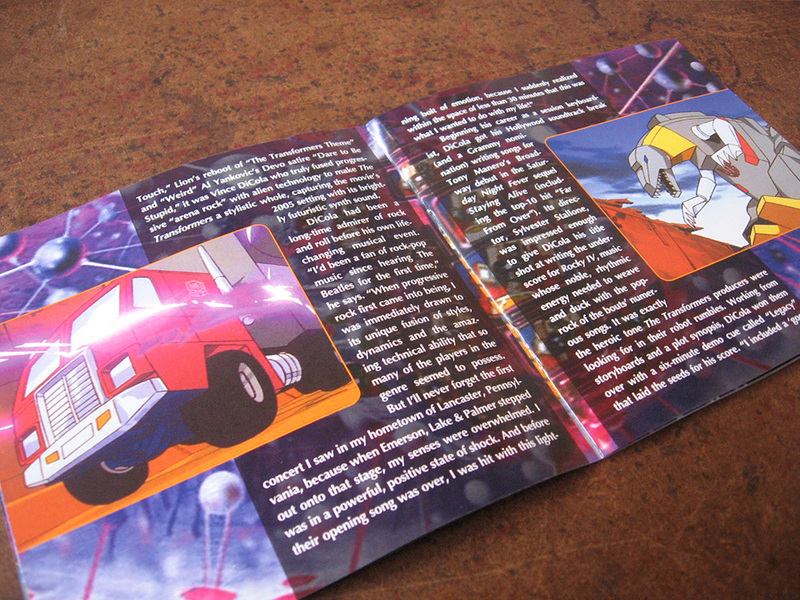 Ultra Magnus’ crew while they repair their crashed spacecraft. theme song for our big1980’s-influenced end-of-course student film exhibition! 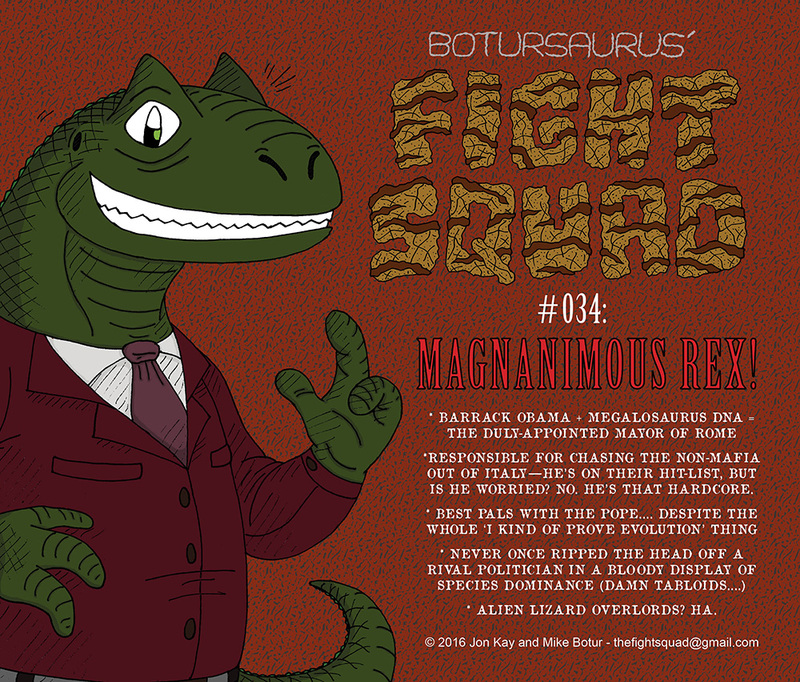 Hot off the press, and joining the ranks of the less-than-totally-corrupt in the Fight Squad universe.... the theropodian mayor of Rome, Magnanimous Rex!